Those who like a quiet, white sandy beach will not be disappointed with the selection to choose from in the area. 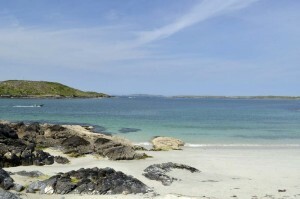 Most beaches are within a short drive of Clifden town. Just off the Sky Road loop is Eyrephort Beach, a quiet beach which looks out onto the offshore islands. The white sands are surrounded by beautiful round stones, shaped by the ebb and flow of the tide over hundreds of years. 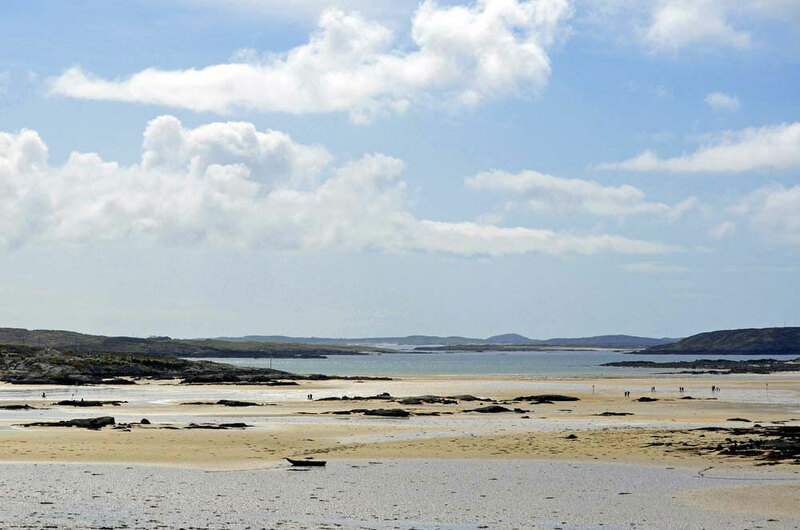 Omey Strand at Claddaghduff is a large expanse of beach and the strand provides pedestrian and vehicular access to Omey Island at low tide. The Omey Races take place here annually. The Ballyconneely area has wonderful beaches at every turn, no matter which road you take. The Coral Strand beach at Derrygimlagh opens out onto Mannin Bay, and is where the Mannin Bay Blueway is accessed. Also along the Bay is of course Mannin Beach, accessed from a side road about 200m on the Clifden side of Ballyconneely Village. In Ballyconneely village itself, take the turn signposted for Connemara Golf Links. Again, along this road you will find several more side roads- all providing access to white sandy beaches. 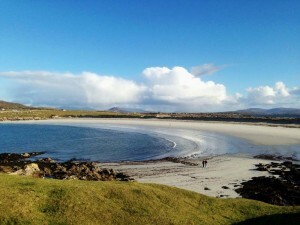 One to note is the surfing beach at Dunlaughin. 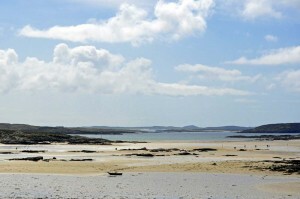 Another beautiful beach to visit is Aillebrack Beach, just opposite the Golf Club in Ballyconneely. 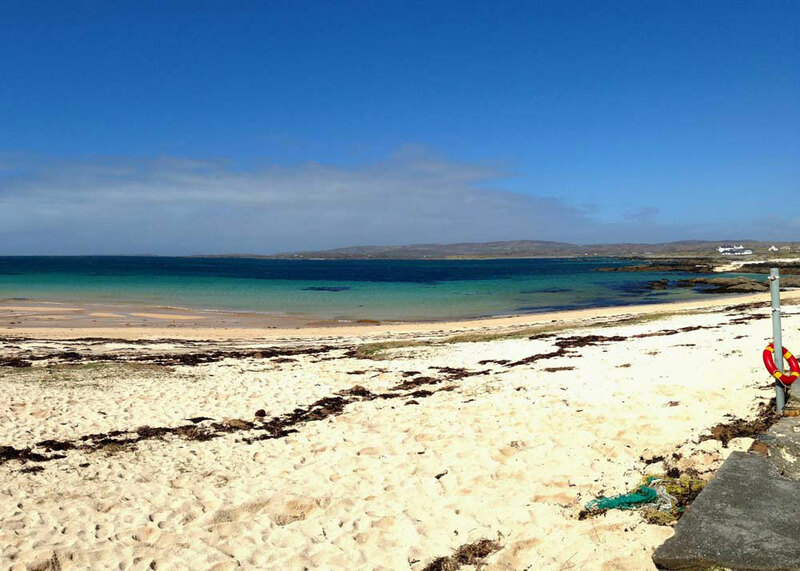 Travelling towards Roundstone, be sure to stop off at the famous Dog’s Bay and Gurteen Beach. These are back-to-back beaches which form a tombolo, jutting out into the Atlantic Ocean. Gurteen is the larger of the two and the closer to Roundstone. The water is crystal clear and it is very safe for swimming and other water based activities. Dog’s Bay faces due west. It is a stunning beach with its bright white sands and crystal blue water. The wild headland which stretches out into the Atlantic between the two beaches is an area of great beauty and is a fantastic walk where you will be surrounded by water on three sides.